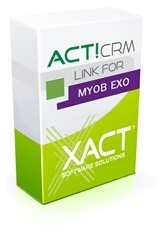 The new MYOB EXO addon for ACT! offers larger organisations a more comprehensive workflow solution for streamlining sales, marketing and accounting information. Act! 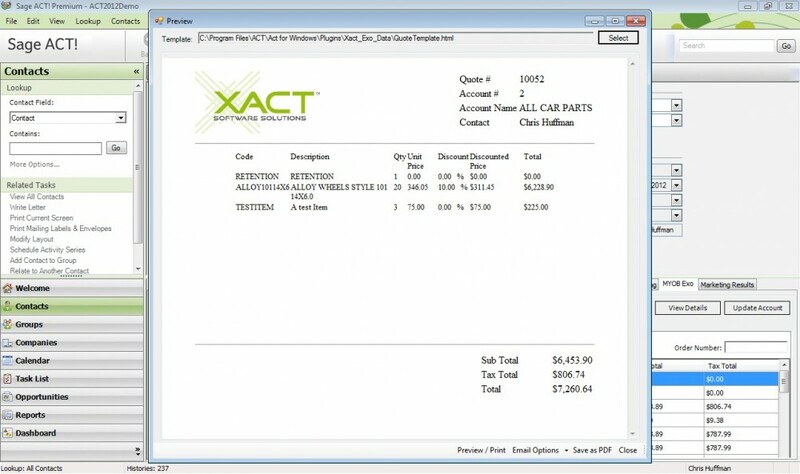 plus Xact MYOB EXO addon combines sales and marketing data about your prospects and customers with important account information – LIVE. No synchronisation, no delays. The result is a centralised database that offers a complete view of your contacts, accounts, activities, sales opportunities and overall business performance. Such intuitive integration eliminates errors, delays, manual intervention and additional paperwork typically associated with multiple databases, allowing your staff to focus on what is important – building relationships and getting results..
See the world's #1 contact manager - ACT!, integrating with MYOB EXO Business. Live integration to EXO Business. New! Set which cost (Average, Latest, Base) is to be assigned to stock items when they are added to an opportunity. The MYOB EXO integration with ACT! is continuously evolving to meet the specific needs of its users. We consider all feedback about how this product can be improved and will continue to add functionality incrementally throughout the life of the product. Why link CRM with Accounting?